SILVER SPRING, Md., July 18, 2017 /PRNewswire/ -- Raytheon Company (NYSE: RTN) delivered updates to its Advanced Weather Interactive Processing System for the current 2017 Atlantic hurricane season, providing meteorologists faster, more accurate forecasting of tropical storms and hurricanes. The improvements include graphical inundation maps that show growing storm surge heights, and improved collaboration capabilities between forecasters and emergency responders in coastal areas. AWIPS is used by meteorologists at more than 140 of NOAA's National Weather Service field offices across the United States to ingest and analyze weather data, and create useful visualizations to predict weather patterns and disseminate information. 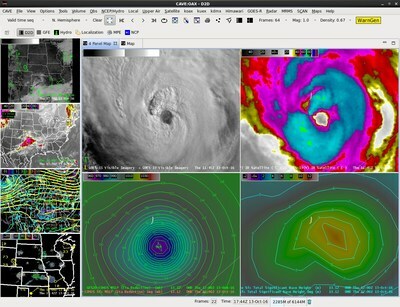 "AWIPS helps meteorologists get the right information to those most likely to be impacted by extreme weather, and for hurricane season, that's people living in coastal areas," said Matthew Gilligan, vice president of Navigation and Environmental Solutions at Raytheon. "They rely on the information this system provides, which is why we're always looking for ways to improve the accuracy and timeliness of AWIPS forecasts."